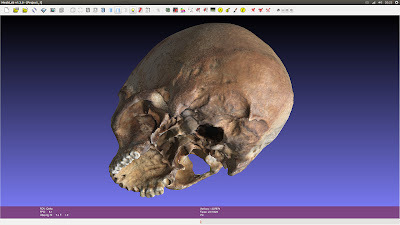 Following with the develop of a protocol to formalize the use of PPT GUI on forensics science, we are simplifying and making more accurate the obtaining of 3D skull using photos. 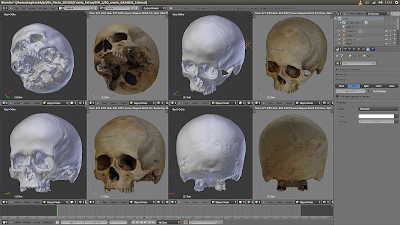 Instead to use Blender to joint the parts of the skull, the entire work is made in Meshlab. If the artist wanna use the skull to do a reconstruction, he/she can import it on Blender with tranquility. The advantage of this methodology is that you can reconstruct the entire skull using the best part of two or more sequence of photos. The work is being developed by Cícero Moraes (me), Dr. Paulo Miamoto and other researchers from Brazil and Czech Republic. Acknowledgments to Prof. Petra Urbanová, head of the Laboratory of Morphology and Forensic Anthropology - Faculty of Sciences, Masaryk University, Brno, Czech Republic; Prof. Rodolfo F. H. Melani, head of the Forensic Anthropology and Dentistry Laboratory (OFLAB/FOUSP) - Faculty of Dentistry, University of São Paulo, São Paulo, Brazil; Mikoláš Jurda - Laboratory of Morphology and Forensic Anthropology - Faculty of Sciences, Masaryk University, Brno, Czech Republic. In order to reveal the limitations of the PPT GUI, a test of scanning was made in bad conditions for this type of acquiring data. 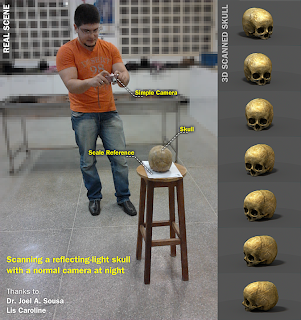 A skull (with reflecting-light) was photographed in a room of low lights an a simple camera, without isolate the scenario. Fortunately the result was good, at least to make a forensic facial reconstruction. The test was made thanks to the help of Prof. Dr. Joel A. Sousa and Lis Caroline. Since 2011, Arc-Team is teaching during the course "digital archeology" at Lund University, introducing the class to the use of Free and Open Source Software (FLOSS) in archeology (with ArcheOS). The course is held by Nicolò Dell'unto (Department of Archaeology and Ancient History). 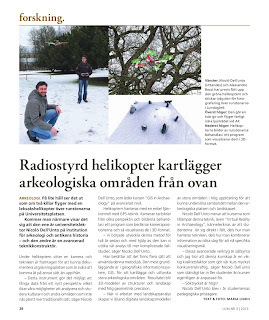 This year we had the opportunity to give a lesson regarding the use of UAV (Unmanned Aerial Vehicles), and more precisely quadcopters, in remote sensing projects. 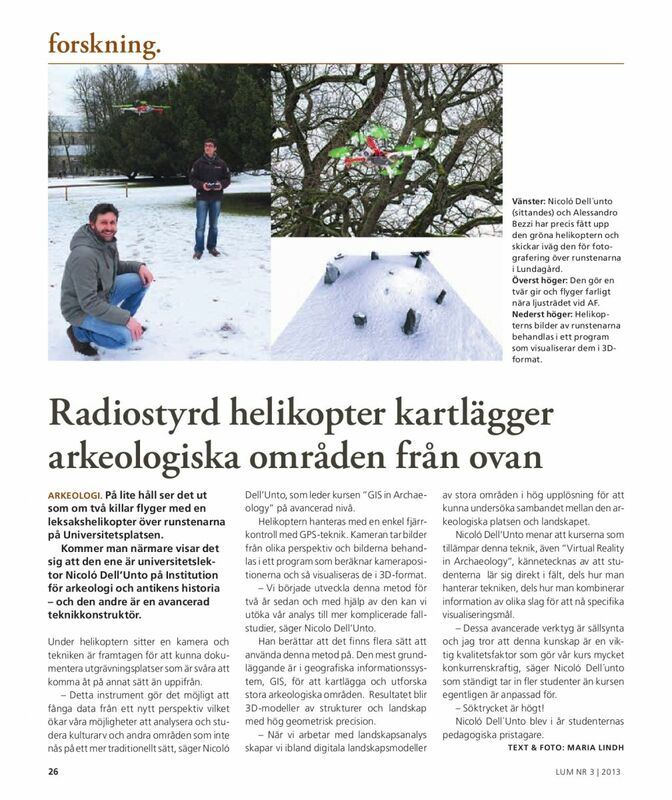 Our airfield was the Swedish village of Uppåkra, where the University is undertaking an excavation. ... and the ability to maintain the position of the last drone we built (more details here). Since I started to study forensic facial reconstruction, more or less one year ago, I had the opportunity to know a lot of interesting things and people that works in a couple of different fields, but with something related to forensics. 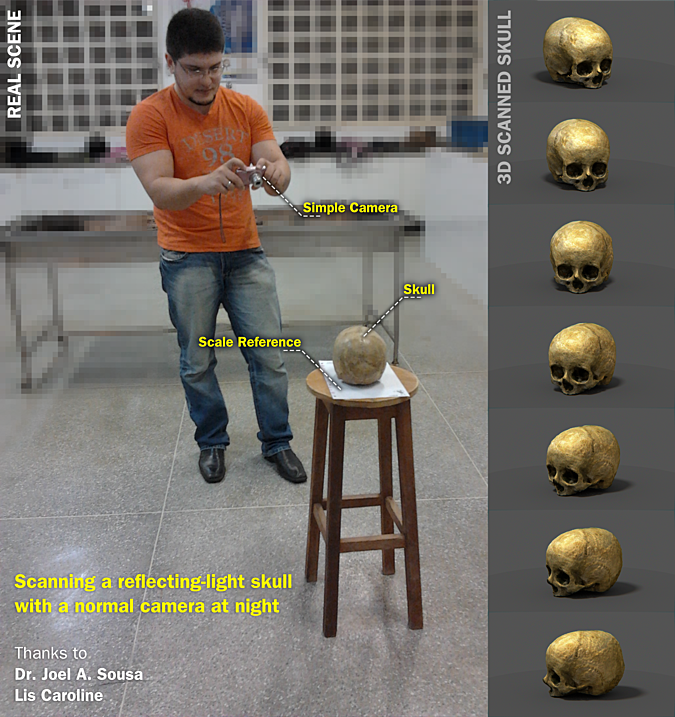 Currently me and Dr. Paulo Miamoto scan a skull using SfM to test the accuracy of the PPT GUI in relation to laser scanning. This is very important because shows an interest of instituitions related to forensics science relative to free software. If is proved that the accuracy of SfM is compatible with the laser scan, it can be an important and revolutionary opportunity to take the accessible technology for a lot of parts of the world that never thought about use it before. We hope this attempt be well succeded. Acknowledgements to Mikolaš Jurda and Prof. Petra Urbanová, head of the Laboratory of Morphology and Forensic Anthropology of the Faculty of Sciences, Masaryk University (MUNI); Prof. Rodolfo Francisco Haltenhoff Melani, head of the Laboratory of Forensic Anthropology and Dentistry of the Faculty of Dentistry, University of São Paulo (OFLAB-FOUSP); and CAPES Foundation, Brasília - Brazil. 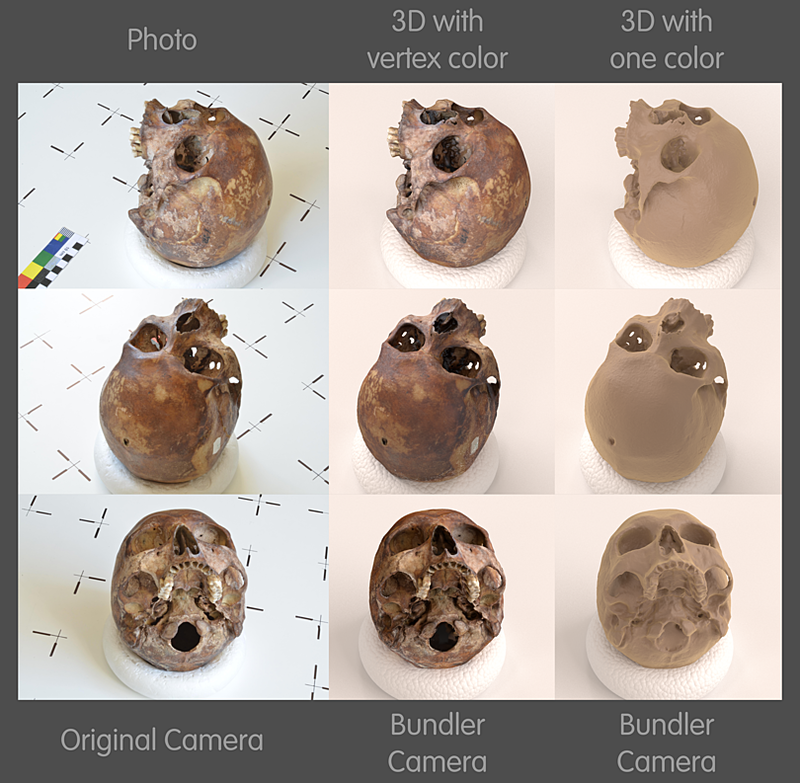 The Taung Project has ended almost six months ago, but today I would like to analyze some of the most remarkable aspects of this experience, which can be considered as an example of open research. 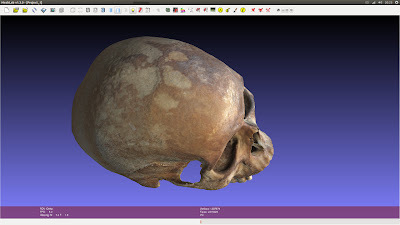 This project, indeed, was able to meet all the three prerequisites that characterize an open research, achieving the primary goal of this blog (open archeology): the team used open tools (software and hardware), shared the necessary knowledge to replicate the experiment and published the data under open licenses. These three elements (open tools, open knowledge and open data) are the basis of the new idea of science that is emerging in recent years and that, hopefully, will also affect archeology as a discipline (and this is exactly the objective Arc-Team is pursuing since more than ten years). Tools, knowledge and data are like the rings of a chain (the research itself) whose potential increases significantly when a complete and free access is guaranteed. If one of these ring is close (broken) or its access is restricted, the resulting weakness can affect the whole cognitive process, till the extreme consequence of invalidating the final result. 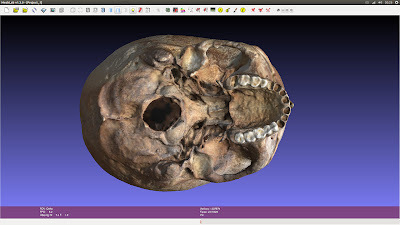 Writing this post I noticed that we never shared the data of this post, which marked the beginning of the experiments that led to the Taung project. 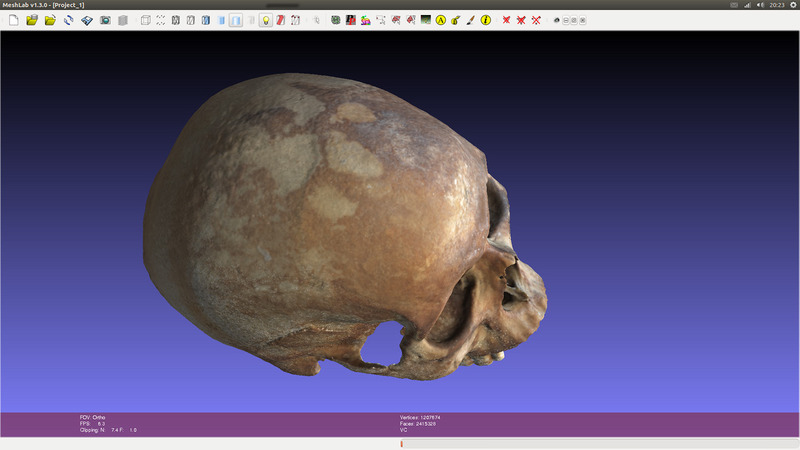 It is now possible to download the 3D pointcloud here and the relative mesh here. Have fun! If I give a coin to you and you give me a coin, each of us will have a coin, but if I give an idea to you and you give me an idea, than each of us will have two ideas. the deadline for ArcheoFOSS workshop 2013 (open source, free software and open format in archaeological research processes) has been extended (if you do not know this meeting, see this previous post). It is possible to submit paper proposal until April 15th, while suggestions for special sessions will be accepted till the 5th of the same month. Methods and experiences of collaboration between different organizations and institutions in the field of cultural heritage, involving the use and the development of open source, free software and open format. 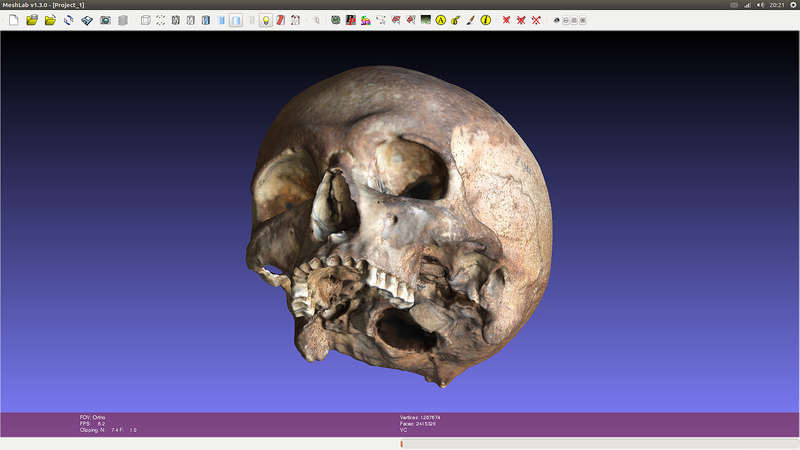 Methods and experience using open source, open data, free software and open format in archeology and ICT. Methods, experiences and development of technological tools during open collaborations between multidisciplinary research areas (humanities and science) in the field cultural heritage. Contributions on the state of the art and proposals for regulations and laws, relating to the management and sharing of cultural heritage in order to support free communication, accessibility and enjoyment. Teaching and sharing archaeological methodologies using FLOSS. The workshop will take place in Catania (Sicily) on 18 and 19 June. As it happened with the previous event, it will be an excellent opportunity to discuss and exchange ideas, knowledge and technology in the field of open archeology.